I don't usually get wrapped up in television shows, particularly since we don't have a tv. But I've read many a book on King Henry VIII and all his drama, so when my uncle, Chris, starting raving about the show I had to go pick up Season One. And so it began. I was immediately sucked in, and the characters are quite well done. Granted, it's kind of trashy, and the first two seasons are by far better than Season three, but I have high hopes for Season 4, which we've just started viewing. So anyhow, when I picked up these little crown muffin tins on clearance at TJ Maxx a few weeks ago, I immediately thought of Henry VIII's 6 wives. I mean just think - if there'd been two extra tins I could've done one for each wife. Although, come to think of it, not sure it would be such a great historical moment to teach my 5 year old about. I'll keep my amusements to myself. Pierce had a cupcake left over from my brother's birthday party, a clementine, English Cottage Pie made from our grass fed beef, and some broccoli. Pierce at every bite of it all! Nothing was leftover. Perhaps he has a few royal delusions himself? For more fun kids' lunch ideas, visit Muffin Tin Mom. I wonder what Henry VIII would have thought if these had existed in his day but his portions would never have fitted in, oh rambling again! What another fun way to serve Pierce's lunch. What fun tins! The cottage pie looks wonderful! I think beheadings take a while to be old enough to hear about. It looks like a fun,yummy lunch! I agree,no need to plant that seed of getting rid of folks by chopping off their heads,lol! Cute crowns and a good lunch inside. Perfect! Such a cute idea but better yet the beheadings out of it. I didn't watch the show until I moved to France and saw it on tv, but now I'm kind of hooked. Wow, I love the little crowns! My daughter would love them too - but there is no way in the world she'd eat the broccoli, so well done there! Those tins are so cute! I need to start looking for more to help with new ideas. Hahaha, yeah, that historical story is best saved for later. My hubs keeps urging me to watch The Tudors, though I have never made the time. I guess I need to get on it. I agree, King Henry Vlll wouldn't be the best representation of royalty for Pierce to learn about! But I do love the royal dishes. himself, being served in such crowning glory! Oh lord, season 3 was so boring. I read a lot about the Tudors, I have a bunch of geeky historical books on them. I have all 4 seasons. And season 4 is better than both 1 and 3, though I still think 2 is the best! I would most certainly gobble that up myself! I'm a total nut for anything historical and British -- Henry VIII was such an interesting character. I've never watched that show but heard it was good. I love your muffin cups! They are too cute!! How fun!! Your kids have got to have the funnest lunches in town... or country. I bet they can't wait to see thier next lunch and what you have in store for them next. What a fabulous lunch!!!! Isn't this series on HBO? So I didn't know you could get DVD's of HBO shows...maybe I'm wrong though. Now I want to go to T.J. Maxx....much as I like it, I never seem to find the great deals there that others do, though! A meal fit for a King...or Queen! Hello There, Since I've been away from blogging for a week, I have alot of catching up to do. We had a wonderful trip to Arkansas --but it's great to visit with my blog friends. Hope things are going well with you. I love the cute lunches that I see all of you bloggers doing. I wish my mom had done that when I was a kid! Do the crowns make brocoli taste better? These are the cutest...and the food looks yummy! I'm going to go shopping for these for my two grand's! Thanks for sharing. The Tudors is such a great show! I loved it all. Downton Abbey is also good. Those crowns are adorable. And they'll hold just about anything. 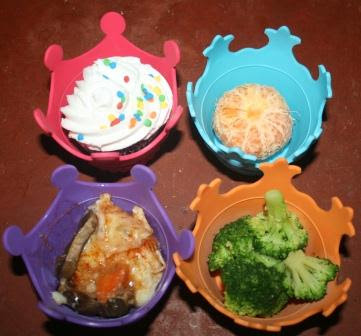 It would be hard not to feel a little "royal" when eating out of crowns! :-) I really like the idea of serving the food in little containers. That way, it doesn't look too overwhelming to a little tummy. Your kids eat so healthy! These are so cute, Lisa! These crowns are adorable! Such fun and creative ideas you have! The crowns are a wonderful way to present lunch! My daughters would have enjoyed seeing their lunch come to them that way. Your crowns are fun and lunch looks yummy!